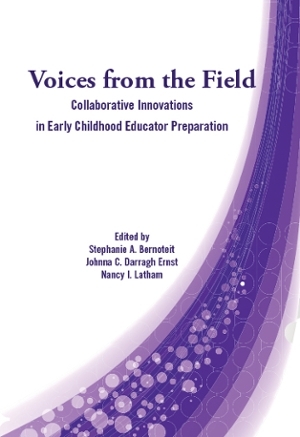 The Illinois Education Research Council (IERC) at Southern Illinois University Edwardsville has collaborated with the Illinois Board of Higher Education (IBHE) to publish Voices from the Field: Collaborative Innovations in Early Childhood Educator Preparation. The book was introduced Thursday, Jan. 26 at an event at Roosevelt University in Chicago to celebrate the early childhood authors, publishers and editors. The book highlights the accomplished work of many of Illinois’ two- and four-year faculty to redesign early childhood educator preparation programs to meet regional and state workforce needs. Stephanie Bernoteit, IBHE, Johnna Darragh Ernst, Heartland Community College, and Nancy Latham, Illinois State University, served as editors. They have been at the forefront of the early childhood credentialing and competency assessment design in Illinois. Project Manager Janet Holt, IERC executive director, received considerable assistance in production from Jennifer Barnhart, IERC research associate, and Rebecca Butler, professor emeritus, Northern Illinois University. The book has chapters authored by early childhood faculty and provides clear, tangible examples of how universities across Illinois worked together, often with regional employers, to design pathways for early childhood educators to earn the state’s industry-recognized Gateways credentials while taking college coursework leading to degrees. Each chapter has a unique focus and the “Voices” provide significant insight into innovative partnerships. “Voices from the Field” is available in the public domain through the IERC website, and can be downloaded and used for non-commercial purposes with proper attribution. Additional IERC research reports investigating the partnership activities and innovative practices emanating from the EPPI grants program are available at hierc.education/ierc_publications.